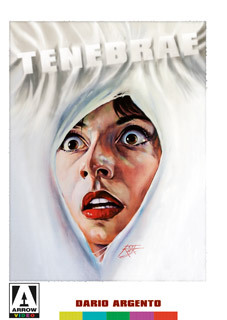 Shortly after American mystery-thriller novelist Peter Neal arrives in Rome to promote his new book, Tenebrae, an attractive young woman is murdered by a razor-wielding maniac who stuffs pages of Neal's latest novel into the mouth of his victim before slashing her throat. So begins a bizarre series of horrific murders, the details of which strangely resemble the fictional murders in Neal's book. Baffled by the killings, the local police believe the author may hold the key to solving the case and turn to him for help. Circumstances change, however, when Neal himself begins to receive death threats from the killer. Widely regarded as one of Italian horror maestro Dario Argento's finest films (it's also got one of the most athletic and persistent dogs we've ever seen in a film), the 1982 Tenebrae marked the director's return to the Giallo genre in which he first made his name, after making two supernatural themed films, Suspiria (1977) and Inferno (1980). Starring Anthony Franciosa (Death Wish II), John Saxon (Cannibal Apocalypse; Black Christmas; Enter The Dragon), Daria Nicolodi (Opera; Phenomena; Inferno; Deep Red) and the stunning Veronica Lario (the real-life estranged wife of multi-billionaire Italian prime minister Silvio Berlusconi), Tenebrae also features cameo appearances by cult directors Lamberto Bava (Macabre; Demons) and Michele Soavi (The Sect; The Church), both of whom also worked as assistant directors on the film. Banned on video in the UK until 1999, when it was released in a cut form, the film was finally passed uncut and uncensored in 2002. Now, this definitive version of Tenebrae comes to DVD, and for the first time in the UK, Blu-ray, boasting a brand new HD restoration of the film and a host of extra features. Tenebrae (Cert. 18) will be released on Blu-ray (£21.99) and DVD (£15.99) by Arrow Video on 23rd May 2011.